To savor or devour, that is the question for Netflix users. The company has examined its members’ binge-watching habits and, not surprisingly, there are interesting insights to be gleaned from how shows are watched. 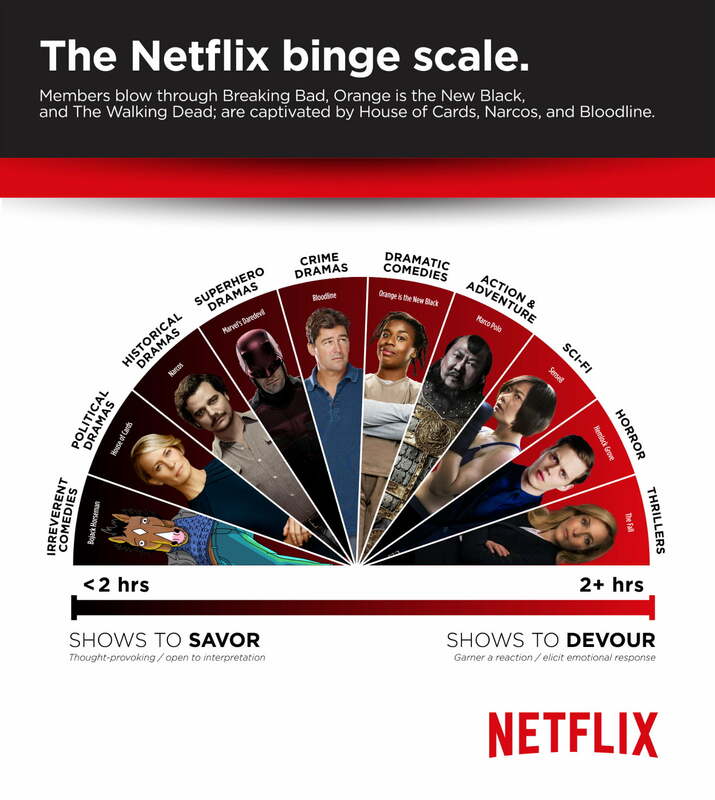 Based on the findings, Netflix created The Binge Scale, which it unveiled Wednesday. In order to do its analysis, Netflix looked at information gathered from the first seasons of more than 100 serialized TV series — Netflix originals and otherwise — across the 190-plus countries where the streaming service is used, between October 2015 and May 2016. From there, the data was narrowed down to users who had completed the entire season, and Netflix looked at how long it took them to accomplish the feat in hours and days. As you’d expect, the completion time was typically fast: The median was five days, with the median hours per session for these users being 2 hours and 10 minutes. Using the data, Netflix identified any series viewed less than two hours per day as “savored,” and any series viewed more than two hours a days as being “devoured.” Netflix also found interesting patterns based on genre. Thought-provoking dramas, for example, are most likely to be savored, giving viewers time to digest. On the other end of the spectrum, what Netflix refers to as “high-energy narratives” are devoured, likely because they often leave cliffhangers that viewers can’t wait to see resolved. Numerous other categories fit in between, filling in Netflix’s Binge Scale. Shows that users are able to savor include House of Cards, Bloodline, Peaky Blinders, Narcos, Daredevil, Mad Men, BoJack Horseman, Love, and Unbreakable Kimmy Schmidt. The pace is much more hurried for shows like Sense8, The 100, The Walking Dead, American Horror Story, Orange Is the New Black, Nurse Jackie, and Grace and Frankie. “As The Binge Scale indicates, the viewing experience of a series can range from the emotional to the thought-provoking,” said Cindy Holland, Netflix’s vice president of original content, in a statement. It looks like there is a method to our binge-watching madness after all.